A popular Wigan to Preston bus service which is due to be axed in January has been handed a lifeline. 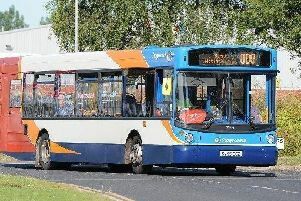 Local operator Preston Bus has made an offer to take over the service, which is due to be scrapped by Stagecoach in the new year. The 113 bus service is due to be axed on January 7, 2019. The 113 service appeared doomed after Stagecoach said it would ditch the service in January after years of falling profits. The service currently travels through Standish, Wrightington, Heskin, Eccleston, Croston, Ulnes Walton, Leyland, Lostock Hall, Bamber Bridge, and Walton-le-Dale before arriving in Preston. READ MORE: 'Severe blow' after 113 Stagecoach bus service is axed. The decision led to a wave of criticism from the communities it serves and residents were quick to raise their concerns with Lancashire County Council. The Council has since put the service out for tender and is offering to subsidise the service. But it is still not known whether the Council would be willing to subsidise the Greater Manchester stretch of the service, which includes Wigan. Preston Bus, formerly owned by Stagecoach, has confirmed it is one of a number of operators to make an offer for the under threat service. A spokesman for Preston Bus said: "Lancashire County Council have issued a tender specification requesting prices to operate service 113. "Preston Bus, like other local bus operators, have submitted a price." But the operator expressed doubts about the County Council 's offer to subsidise the service. The spokesman added: "Whilst Lancashire County Council have issued a tender specification, it does not mean a contract will be awarded, especially given their budget is already overspent." The Council confirmed it has received a number of offers for the beleaguered service, which are under consideration. A spokesman for Lancashire County Council, said: "We're concerned about the impact on passengers of the commercial decision made by Stagecoach to cease the 113 service, and have sought tenders from transport operators in order to be able to consider the option of providing a replacement service. "However these tenders are currently being assessed and no decision has been made about whether to fund a replacement service." The Council said it will consider the viability of the service before making a decision. Cabinet members met with Stagecoach for further discussions on Tuesday. According to Coun Barry Yates, South Ribble East, the Council are confident the service can be saved. Coun Barry Yates said: "After a good meeting with Stagecoach today regarding the 113 bus service, Lancashire County Council Cabinet Member Keith Iddon will now take the retention of the service to the next stage and is very optimistic that the service will be ratified. "Keith and I are very happy with the outcome of the meeting with Stagecoach and will give everyone a full update on the 113 bus service early in December." But yesterday, Stagecoach firmly reiterated their intention to scrap the service. A spokesman for Stagecoach said: "From Monday January 7, service 113 between Preston and Wigan will be withdrawn. "This is not a decision the business has taken lightly. We have exhausted all options to keep the service in operation, but there has been a significant decline in the number of passengers over a long period of time and without financial assistance, the route is unfortunately no longer viable. "Stagecoach made Lancashire County Council aware of its decision well in advance and we will be working closely with them to assist them where possible in providing alternative transport arrangements for communities affected." Efforts to save the service have been welcomed by South Ribble MP Seema Kennedy and local councillors. Mrs Kennedy said: “I am extremely disappointed to hear of the cancellation of the 113 bus service. Many local people rely on this bus to get to work, school and important services, such as the hospital and library. "Public transport has an important role in preventing social isolation and loneliness, especially in more rural areas. "It was only last year that I successfully fought to reinstate the service between Croston and Chorley. This decision will leave communities, such as Croston, Ulnes Walton and Moss Side, with severely reduced access to the shops, work and college. Coun Matthew Tomlinson, who is the county councillor for Leyland Central and South Ribble councillor for Broadfield ward, has urged the County Council to make an 'attractive offer' to the bus operators. He said: "I welcome the fact that Lancashire County Council have listened to local people and put a tender together to try and save this service. But until someone comes forward to bid for that tender there will continue to be lots of local concern. "Its up to LCC to ensure that their tender is attractive enough to ensure someone does come forward or it is our most needy residents who will suffer. "The loss of this service is going to leave a huge swathe of Leyland without any sort of bus ‘service’ at all. "Since the demise of Fishwick’s and Stagecoach's' rerouting of the 111 service, residents along Leyland Lane and Golden Hill Lane no longer have direct access to any regular bus service. "The 113, which currently goes along Broadfield Drive did, at least, provide some sort of accessible service for the residents of Broadfield estate." These concerns were echoed by Coun Mike Titherington, who also represents Broadfield in South Ribble. He said: "Leyland has suffered from withdrawal of bus services and changes of routes and this has led to many people becoming isolated because of the lack of access to public transport. "I have raised the issue with bus operators and the cabinet member for transport on behalf of residents on Golden Hill, without success. "My view is this is a direct result of deregulation and the government's austerity programme." Jane Bell, councillor for Seven Stars ward, lives on Leyland Lane which is served by the 113 service. She said: "When Fish wicks ended and the 111 service ceased, along with Cllr Mal Donoghue, we liaised with Ava Coaches and a Circular Bus was in service for a year until last December. "Sadly it was withdrawn because not enough people used it to make it financially viable. Businesses sadly have to make ends meet. "Cllr Donoghue has been in regular contact with Stagecoach about the bus services in general in Leyland. "Many older residents are already having to use taxis to go shopping or visit friends because there is not a bus service which is convenient for them and this can be costly and can prevent them having a decent social life. "Transport is key in combating loneliness and isolation. "South Ribble are working hard to combat this issue by becoming Dementia Friendly and having a regular information stall on Leyland Market. But it will be no use if people cannot get there." Lancashire County Council are expected to make a decision on the future of the 113 bus service in early December.